I recently attended the Web 2.0 Summit in San Francisco hosted by Tim O’Reilly, John Battelle, and TechWeb. One of the highlights of the conference was a discussion between Twitter co-founder Evan Williams and FM Media’s John Battelle. It was a revealing and enlightening examination of the rise, state, and future of a social network that has been nothing short of transformative in its few short years of existence. What appeared pervasive with every question, answer, and observation is that Twitter’s success prevails in spite of its obvious hurdles, limitations, and absence of clear direction and vision. Twitter is a wondrous marvel and rare phenomenon whose surge to profound cultural prominence has completely transformed how people communicate, share and discover events and information. Its success is one that cannot be retraced. I wanted to share a few highlights as Williams spoke convincingly and honestly through statements that always seemed to fall within 140 characters. I know, because I actually live-tweeted the event and marveled, and relished, at the fact that I did not need to edit or truncate his words to fit within Twitter’s self-proposed restraints. I found this to be an interesting comment as it aligns with my observations of Twitter’s role in transforming how we establish connections and interact with one another. Good friend Chris Brogan has described Twitter as a serendipity engine, which is also true in some cases. In many ways, our experience within and value derived from Twitter is tied directly to whom we follow and information crosses our paths while online. As such, we define and refine our connections based on those with whom our ideas, beliefs, and interests align. In the end, Twitter is a social network, an information network, and a serendipity engine that essentially forms what I call a contextual network or human network. Battelle was clear and frank when he asked Evan Williams why traffic at Twitter.com was curtailing. The truth is that while many existing users are engaging on Twitter via third-party clients such as TweetDeck and Seesmic, many potential new users are unclear to the advantages, possibilities or basic next steps once visiting and/or registering for the service. While Twitter attempts to host your Social OS, it has more work to do in order to communicate its relevance and significance. However, as Williams alluded, Twitter would soon release new features that would increase the value of Twitter.com as a destination of interaction. The first appeared to be its new Lists and List Widget services. The second announcement in the lineup of new features also includes a new framework for retweets. Twitter has had its fair share of growing pains, however, after a few years of technical advancement, Twitter as a platform can’t seem to shake the legacy of the #failwhale. Problems persist, but growth continues. Of course there have been several rumors about the potential acquisition of Twitter. At one point rumors swirled around whether or not Google, Microsoft, and Apple were considering or entertaining acquisition strategies. And, with recent investments placing the valuation of the company at over $1 billion, the discussion concluded with Ev’s very direct and candid response. Twitter is not for sale – not yet anyway. As the competition for your social graph escalates, Evan Williams believes that the so-called race is mostly fabricated by the media as a form of sensationalism and link bait. Numbers agree. However, as Evan observed, “Most people I know use Facebook and Twitter.” Perhaps it’s just that simple. In an honest answer to Battelle’s question about the future and potential impact of Google Wave, Ev didn’t speculate. He admitted that even he didn’t have an idea as to the extent and direction of Twitter either. Google Wave is the latest social media darling, mostly because its availability proves elusive and seemingly exclusive. Those who have interacted with Wave in its current private beta stage have been greatly disappointed. However, the platform it introduces will force the real-time evolution of how we engage and interact on the social web. It’s a portal into a new genre of collaboration and communication and Twitter will be part of the experience, not necessarily displaced by the forthcoming tidal wave. According to Evan Williams, Twitter’s growth is in mobile and also in several countries worldwide. Twitter is a global play and it will follow Facebook’s path to global ubiquity. In conclusion, Evan Williams acknowledged the need to kill the list that divided the community, the suggested user list. Twitter’s new user-generated lists will serve as its replacement. Why is AirBnB Singled Out by Government When Web 1.0 Competitors are Ignored? Hi Brian, I wonder if you can elaborate why you disagree with Ev that Twitter is not a social network. I agree with that sentence. Why don't you? Ari, I think it's pretty clear…I don't disagree with Ev's observation…I see it as meaning different things to different users. The value is in the eye of the beholder. To me, Twitter is an information network. To Chris Brogan, it is a serendipity engine. To many, it's all of the above, plus a social network. Maybe I need to get a personal tutorial from EV himself. I'm having trouble finding value in the list function, outside of it being like a virtual organizer. And yes, I fully understand that with this function being so new, it could very well be that I just don't fully understand how it supposed to work. But I just don't see it being anything more than an organizer, which has it value don't get me wrong, but not in the wider scope of things. Funny. If my customers wanted to call my network a social network, I might be inclined to let them. Thanks for the sum up at the summit. We appreciate having a chance to read it. I couldn't find your email adress on your website so I'm going to post this as a comment instead. I just read a blog post that explained in a very clear way why traditional marketing is being destroyed by social media. I thought it would be interesting read for you. Quotes like “On the internet, your biggest competitor is not other companies. But, the quality of your own products, and the authenticity of your message. ” are just brilliant in my opinion. So, Google is coming out with a social network….wow…..I don't know if it will compete with Twitter or Facebook. I will do some research on Googel Wave and see if its something I might use in the future. Pingback: PR Me! 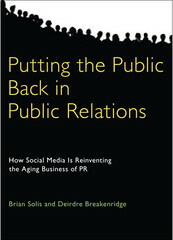 » Blog Archive » How can Twitter help PR?